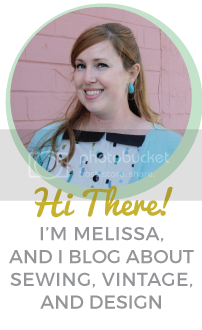 Hi, I’m Melissa. I’m a vintage lover, longtime sewing enthusiast, dedicated thrift shopper, aspiring fabric designer, and avid DIY-er. After discovering the world of blogging, I started Mint Green Sewing Machine (Formerly Scavenger Hunt) in 2012 as a way to share my passions for crafting, sewing and vintage. I currently live on the central coast of California with my husband Phillip and our two kitties, Ruby and Bosley. By day, I work as a graphic designer and in my free time I work on blogging, sewing, and running our online shops. (You’ll often find me at a thrift shop too). Recently, I’ve been combining my love of design, sewing, and retro style and creating vintage-inspired novelty skirts which you can see in the Shop section. Phillip and I sell our illustrations in the form of posters, cards, and even a couple of toys over at Lookie Here Designs, and we also have a shop where we sell vintage finds called Bos and Ruby Vintage (yes, it’s named for the cats!). I also still have my little Etsy shop where I sell vintage sewing patterns, fabric, and notions, Paper Doll Patterns. I love meeting new friends who share my passions, so feel please feel free to comment or email me, I’m happy to hear from you!